We were asked by the Worthy Grand Matron of the Order of the Eastern Star to make a small boxed poppy to be given away as gifts at the Alberta Grand Chapter meeting in Calgary in early June 2017. They ended up going across Canada and the United States. The poppies measured approximately 3 inches in diameter. We used Spectrums # 359.1 Red & White Wispy Glass for the petals and Spectrums # 1009 Black Cathedral and # 1009W Black Waterglass. In total we made 75 of these Poppies. Unfortunately we forgot to obtain a photograph of a completed one hanging in the sun. 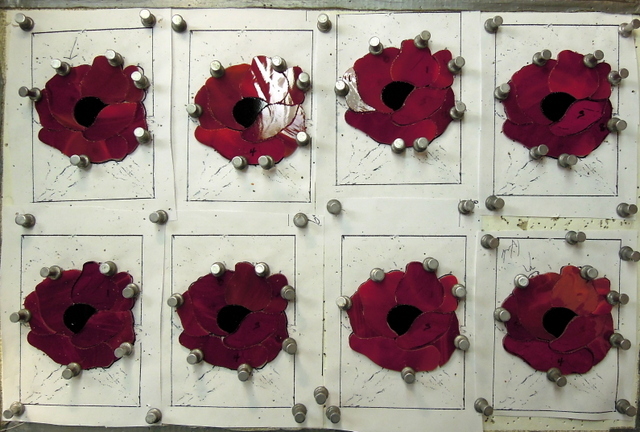 The photo shows 8 ground poppies ready for foiling, then soldering and cleaning after the various stages with Kwik Clean, they then had black patina applied along with Clarity Polish.